I was preparing some revised GCSE booster lessons for MyMaths recently on the topic of Quadratic Equations. 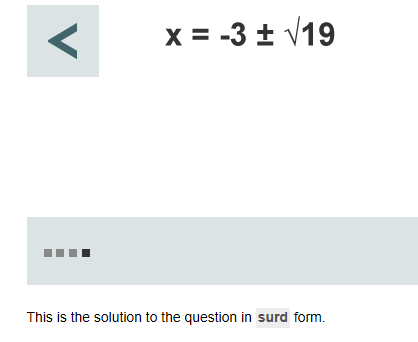 In some examples I requested that answers be left ‘in surd form’. By this I meant those irrational solutions coming from completing the square or using the quadratic formula. My editor’s response made me stop and consider: what does a student understand by the phrase ‘surd form’? This is just another example of how, as a teacher, I may have used mathematical language fairly loosely in the normal course of teaching (I posted an article about the ‘roots’ of an equation last year, having never really used the word accurately). It makes me realise that teachers can be quite isolated in their lessons and their word can be taken as gospel, perhaps with the exception of an occasional super-bright student who might question a definition or seek clarification on a fact. Habitual usage turns into belief in what one says, and consequently thousands of students (my teaching career spans 35 years) also absorb the definitions one delivers, and possibly pass them on to other future students. With such responsibility we should try and get things right. Beginning to double myself, I started to check whether such a thing as surd form existed. A look through the DfE specifications for GCSE revealed no occurrences, and I did not find the phrase in any of the Sample Assessment Materials from the exam boards. The answers here are of the form √a (√7 and √10). Other examples allow a rational multiple of a surd to be surd form, i.e. a√b. My ‘surd form’ had been to describe a rational number plus a surd. It seems that I am not alone in the use of the phrase in this way. But is it correct? Some pages from a surprising source – the Karnataka Examination Authority in India offer the kind of precision needed to clarify my uncertainty. Surd: An irrational root of a rational number. General form of a surd: n√a is called a surd of order n, where a is a positive rational number and n is a positive integer greater than 1. And there it is. What I was asking for as the answer to a quadratic equation was actually that it be left in BINOMIAL SURD FORM. I don’t think this would be appropriate for a GCSE student, indeed the lack of use of the phrase surd form by the DfE rules against it. However, it is useful to know there is a definition of this (fairly common) form of answer. Are there other phrases I could have used? Leave answers in exact form. Leave a surd in your answer. Do not use a calculator. Give your answer in the form a + √b. What do other people use? Steve Fearnley, MA MEd PGCE, has been a maths teacher for over 30 years as well as being a deputy headteacher. He is now a private maths tutor, covering KS3 up to A Level, as well as an author for both MyMaths.co.uk and our brand new AQA GCSE Maths Student Books.